« Season finale of the Texas ethics bill a cliffhanger; Series finale still to come. Heaviest Downpours Rise across the U.S. According to an article in Scientific America by Climate Central on May 27, 2014, very heavy rainfalls now happen more often across most of the country, delivering a deluge in place of what would have been routine heavy rain. Record-breaking rain across Texas and Oklahoma this week caused widespread flooding, the likes of which the region has rarely, if ever, seen. For seven locations there, May 2015 has seen the most rain of any month ever recorded, with five days to go and the rain still coming. While rainfall in the region is consistent with the emerging El Niño, the unprecedented amounts suggest a possible climate change signal, where a warming atmosphere becomes more saturated with water vapor and capable of previously unimagined downpours. Several people have been killed and hundreds have been rescued from their homes. Texas Gov. Greg Abbott has already declared disaster areas in 37 counties. These torrential downpours follow weeks of unusually rainy weather across the Southern Plains. And they stack up to a broader trend in the region, and across the U.S., toward more heavy precipitation. 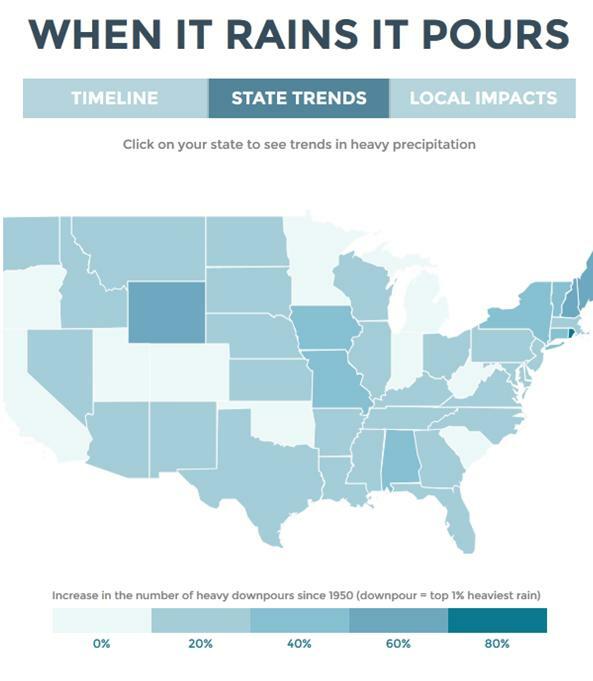 Explore these trends in heavy downpours in your state or town, and some of their impacts in our new interactive above. These intense bouts of rain can wreak havoc on communities. They cause flooding, close schools, businesses, highways and airports, compromise roads and bridges, trigger sewage overflows, and routinely produce million of dollars in damage and kill people. In Nashville, for example, a 2010 record downpour dumped 13.6 inches of rain in just 2 days, causing an estimated $2 billion in damage. 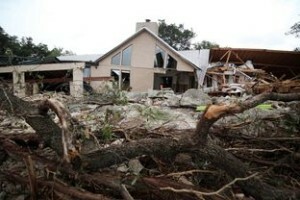 Eleven people were killed, 11,000 homes and businesses were damaged, and 2,700 businesses suffered closures. Intense rain in Detroit in August 2014 killed two, caused an estimated $1.1 billion of damage, and affected 118,000 homes and businesses. Heavy rain events may also pose a potential health risk; one recent study found that about half of all waterborne disease outbreaks in the U.S. (between 1948 and 1994) were linked to days of very heavy rain. That means that there is often a lot more water available to come down as rain. Climate scientists have already shown that increasing greenhouse gas concentrations as a consequence of human activity are partially responsible for the average global increase in heavy precipitation. Our analysis examines the heaviest downpours—the days where total precipitation exceeded the top 1 percent of all rain and snow days—at over 3,000 rain gauges distributed across the country over the period 1950-2014. Although some cities have rain gauges that have been around since the 1860s, by the 1950s, about 90 percent of the current list of 3,000 stations was in existence, giving us a consistent 65-year period of study over the whole U.S.. The vast majority of this heavy precipitation came as rain, although in a few rare instances, major snowfalls also count toward these large events. Heavy precipitation is highly localized, far more than extreme heat, which typically covers relatively large areas. On a 98°F day in New York City, similar high temperatures are usually also found across the entire metro area. On the other hand, an extreme rainfall event can inundate the Long Island suburbs and leave the city itself relatively unscathed. This makes heavy rainfall trends difficult to measure, because rain gauges are not always located where extreme rains occur. Moreover, local heavy precipitation trends may not accurately reflect changing patterns happening at a larger, regional level. As a consequence, even in regions or states where there is a strong increasing trend in heavy precipitation, the trend at an individual precipitation gauge that represents the official total for a city may be equivocal, flat, or even down. Our state level analyses of extreme precipitation events shows a strong increasing trend since the 1950s, with 40 of 48 states showing at least some increasing incidence. Consistent with earlier research, six of the top 10 states with the biggest increases in number of days with heavy downpours are in the Northeast, including Rhode Island, Maine, and New Hampshire, which have seen the number of heavy rain events in the last decade increase by at least 50 percent compared to the 1950s. Our analysis of cities and metro areas, on the other hand, reveals the highly localized and random nature of extreme rain events and the difficulty of detecting these events even with 3,000 rain gauges across the country. In a number of states and regions with clear increasing trends, individual locations show a weak trend or no clear trend at all. This apparent inconsistency says little about the overall trend in the heaviest precipitation events, but a lot about the weaknesses of single-point measurements for detecting trends in extreme precipitation. An example of this phenomenon is Boston, where the local trend is flat but at the state level, Massachusetts has seen a relatively steady increase in heavy downpours since 1950. Climate scientists predict that the recent trends toward more heavy downpours will continue throughout this century. Climate models predict that if carbon emissions continue to increase as they have in recent decades, the types of downpours that used to happen once every 20 years could occur every 4 to 15 years by 2100. As the number of days with extreme precipitation increases, the risk for intense and damaging floods is also expected to increase throughout much of the country. To see the interactive data on the original Scientific America article, click here. A flood-damaged house in Wimberley, May 25, 2015. This puts Texas leadership at odds on their stated views about climate change and their responsibilities to the citizens of their state who are reeling from the impacts of flooding throughout the state over the past week. At what point does Texas take action on climate change with a building national and scientific consensus that climate change is real and the government needs to do something about it?